I think it will take a long time each day, so I don't start. I don't want to throw stuff in the landfill. There is stuff that I don't need, but it doesn't seem like garbage, it seems like something someone can use - or maybe I'll use it "some day". Thinking about what to get rid of and how to get rid of it slows me down. I'm going to try a couple changes. 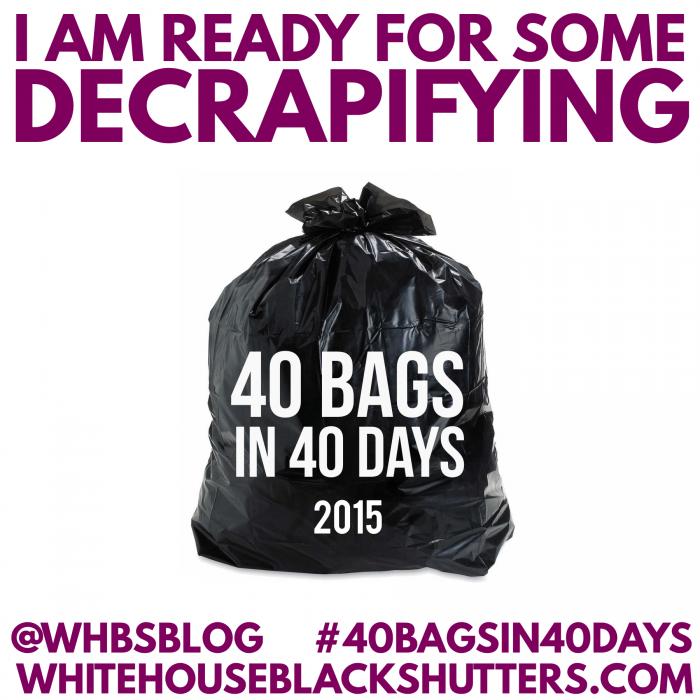 Rather than focus on the 40 bags, I plan to focus on 40 areas of the house that need de-cluttering (using the planning sheet). I will pick one small area each day, set my timer for 15 or 30 minutes, and stop when I finish so I don't get burned out, following the flylady decluttering guidelines. In January, I decluttered my bedroom. The difference is amazing - once the dressers are free of junk, I don't want to mess them up again. Once you see results, it keeps you going. On to Problem 2. Which stuff to get rid of, and what to do with it. Do you love it? Does it make you smile? If not, do you use it? If not, then get rid of it. Where does it go? HHW In Naperville Information Sheet (PDF) - New Location - Jefferson and Forthill (Not in the Fire Station Anymore). They made the drop-off bigger so cars can move thru more quickly. Medicine Disposal - at many local police stations (not Warrenville), and HHW- Dump all the pills into a ziplock bag. No more excuses. .... I'm going to do it, and mark a star on calendar each day it's done - starting with my linen closet. How about you? Are you ready to decrapify? If you have questions about what to do with "stuff" - write them in the comments, and I'll figure it out & post back. Also, feel free to write that are committing to this project in the comments.